Beautiful pink tree grows up to 100 ft (30m) Pointed elliptical leaves, usually 5 joined at the same place on stem. Beautiful pink trumpetshaped flowers. Fruit is capsule with several winged seeds. Bark is very tough and hard to peel. The inner bark is the part used medicinally. It’s usually dried, shredded, then boiled as a bitter tasting but well-known strong antibiotic, anti-viral, anti-cancer, disinfectant, anti-tumor, and anti-fungal agent, especially for treating candida infections. Contains 18 antiseptics and 5 anti-inflammatories. Good for mouth care, gingivitis, gums and teeth, add powder to existing toothpaste. Best taken in combination with other herbs, like chaparral. 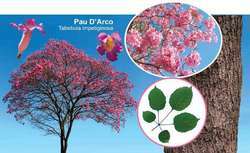 Photosynthesis, growth and development of Tabebuia avellanedae Lor. Influence of the drying and storage on the seed viability of Tabebuia avellanedae Lorentz ex Griseb. aureus con valores de CIM entre 20 y 540 mg/mL en las especies Arnica montana y Tabebuia avellanedae (50 mg/mL), Gossypium herbaceum (123 mg/mL), Kigelia africana (138 mg/mL), Uncaria tomentosa (200 mg/mL), Chrysophyllum cainito (220 mg/mL), Cnidoscolus chayamansa (280 mg/mL), Allamanda cathartica (304 mg/mL), Sansevieria trifasciata (385 mg/mL), Diphysa punctata (450 mg/mL) y Ficus luschnathiana (540 mg/mL), (Tabla 3). 2013) lograron identificar la madera utilizada construcciones historicas jesuitas en Cordoba (Argentina) del siglo XVII, incluyendo la Sacristia de la Capilla Domestica de la Compania de Jesus, patrimonio cultural de la humanidad, e identificaron piezas de Prosopis alba, Juglans australis, Tabebuia avellanedae y Aspidosperma quebracho-blanco. beta]-lap was synthesized in the Department of Antibiotics of the UFPE from lapachol extracted from the sawdust Tabebuia avellanedae, according to the methodology described by Lima et al. The hexane extract of the Tabebuia avellanedae (synonym Tabebuia impetiginosa) heartwood and its fractions exhibited antibacterial activity against methicillin-resistant Staphylococcus aureus (MRSA) and methicillin-sensitive Staphylococcus aureus (MSSA). In vitro and in vivo anti-inflammatory effects of taheebo, a water extract from the inner bark of Tabebuia avellanedae. New furanonaphthoquinones and other constituents of Tabebuia avellanedae and their immunomodulating activities in vitro. Com relacao ao porte, constatou-se que a altura media das arvores de maior ocorrencia na Zona 7 situa-se entre 8 m (Caesalpinia peltophoroides) e 12 m (Tipuana tipu), destacando-se as que apresentam media de 10 m: Tabebuia avellanedae, Jacaranda sp. One of the two compounds identified by this process was DAL, derived from Tabebuia avellanedae, a tree native to Argentina and Brazil. They described how this compound called dehydro-alpha-lapachone (DAL), derived from Tabebuia avellanedae, a tree native to Argentina and Brazil, was able to help wound healing and inhibit tumor growth in animal models.